We’re all sick if this weather. It’s ridiculous. I can’t stop sneezing and coughing, I still have to wear my winter coat and I instantly get a cold if I don’t wear a scarf. This is madness! I’m so ready for drinks in the park, watching people from the terrace and summer festivals. Luckily, the girls behind Krijg de Kleren! feel the same way. So why don’t we all just pretend it’s warm and maybe we’ll trick the sun into shining? Swap last year’s (clothes) successes with someone else’s. With this in mind, that’s why Krijg de Kleren! 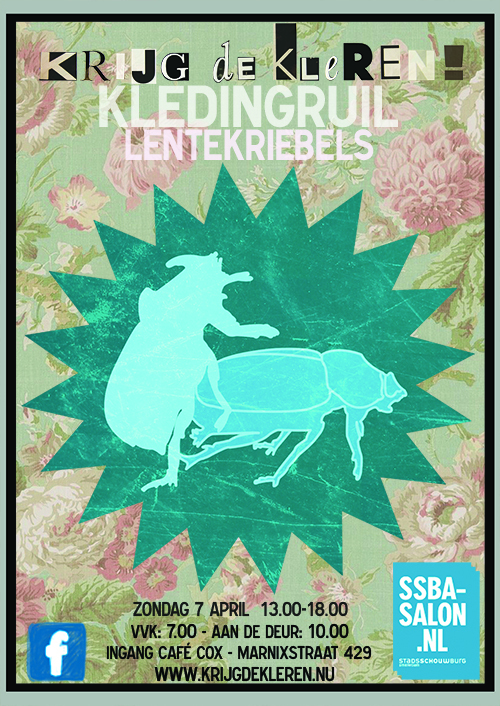 is hosting its spring edition on 7 April: Krijg de Kleren! Lentekriebels. Join them and swap last year’s successes with someone else’s. Did you shine in your festival shorts, oversized blouse and sneakers in 2012 but are ready for something new? Or what about that dress that’s been hanging in your closet forever without being worn? Come to Krijg de Kleren! and make yourself and someone else happy with a new spring wardrobe. You can swap up to ten items. For each item you bring, you can take another one home. Think accessories, shoes, tops, dresses: everything. And besides swapping clothes, you can have your nails done, get fashion advice and much more. For more information, check out the website.